Tyvek Travel Luggage and Bags: Travel Smart - Travel Light! Nobody really wants to carry stuff but sometimes we have to. We have to carry things when we travel or when we go to the gym. It can be a bother. Well, you cannot avoid this but you can try to minimise the weight you have to carry and one way of doing this is to use a lightweight bag. What is so special about BO-BORSA travel bags? BO-BORSA travel luggage is made of Tyvek®, the amazing material manufactured by DuPont in the U.S.
Tyvek® has many advantages. It is extremely strong and almost impossible to tear. It is waterproof, washable and resistant to most oil or grease and so will never stain. But, one of its major benefits is that it is extremely lightweight. In fact Tyvek® weighs even less than paper. Imagine that, a very strong bag which weighs less than if it were made of paper. 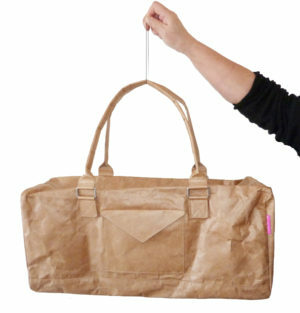 In fact, BO-BORSA Tyvek® travel bags are so lightweight that a bag can be suspended with a single human hair. It is also waterproof, washable and UV resistant so will not be damaged by sunlight if you take it on holiday. It is also 100% recyclable which is very important these days. 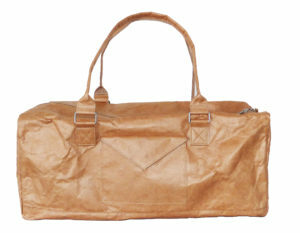 The BO-BORSA original brown travel bag is perfect for carry-on luggage. It is soft and will squeeze into overhead spaces which hard bags will not. It can also be rolled up or folded for storage when you get home. As well as for travelling it is perfect for carrying your sports or gym gear. One thing you can be sure of is that if you carry a BO-BORSA travel bag it will turn heads and is a great conversation starter. After all who would have a travel bag that looks as though it is made of paper and yet is so strong? The BO-BORSA travel bag in original brown paper colour is fully lined with an outside pocket and is available with brown or pink zips. It is also available with our famous and original newspaper print design. Travel smart – travel light!